3.Do you offer FREE samples? 4.How to make a payment? 5.How to apply my credit left on Pandahall for my new order? 6.How to make a payment for my order via credit card? 7.What is your discount policy? 8.How can I know the status of my order? 9.Can I make any changes to my order And how? 10.How do you deal with those temporarily unavailable items after I place an order? 11.How long does it take to ship my goods from China to my country? 12.Can we pay the shipping in the destination? 13.How do I save on shipping? 14.Do you ship to PO Box? 15.Do you offer FREE Shipping? 16.Can I purchase the goods in mixed colors or sizes? 17. Why are the goods in mixed color I received are not exactly same color as the picture on your website shows? 18. What can I do if I could not find the goods on your website? 19.Can I use your pictures or descriptions on my website? 20.What if the goods arrive damaged? 21.Why I can't get your email responses? 24.The Difference between PandaHall & PandaWhole? 2.How to do if I forgot my password? 3.What are the benefits of registering with PandaHall? 4.I Can't Log In My Account! 5.Will my shopping cart be remembered if I leave the site and come back? 7.How to place an order? 2.Are the prices on PandaHall in USD? 3.Why are your prices so good? 4.Do your prices include shipping cost? 5.Does your price include duties or VAT How much tax do I need to pay? 6.If I place a purchase over 2000 dollars, when the 15% discount will be provided before paying? 2.How long does it usually take to process orders? 3.Do you have a minimum order quantity? 4.Can I make any changes to my order And how? 5.How can I know the status of my order? 6.How do you deal with those temporarily unavailable items after I place an order? 7.How much is the TOTAL cost I need to pay for my order? 8.How soon can I receive my order and how much will the freight cost be? 9.How to calculate the replacement discount? 10.How can I do If the products in my order are short of stock? 4.What can I do when i can not make payment for my order through Pandahall? 5.How to apply my credit left on Pandahall to my new order? 7.How do I do if my country Isn't available In PayPal? 8.How Can I Contact PayPal Customer Service? 3.Can I purchase the goods in mixed colors or sizes? 4.Are all your products available in stock? 5.How can I require from one item two different colors for the minimum quantity? 6.What can I do if I could not find the goods on your website? 7.Can you provide your findings plated in silver color, gold, copper, black or antique bronze? 8. What's your Tibetan silver beads, What's the difference between Tibetan silver and Sterling silver? 9.Is nylon treated the same as polyester? 10.Are Cloisonne beads Nickel Free? 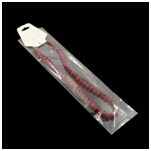 11.Are all your porcelain beads Lead Free? 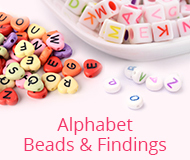 12.Are zinc alloy beads Nickel Free? 13. Is Wool cord indeed in wool? 15. What is acrylic CCB coating / What is CCB Material? 16. What is the difference between Platinum plated metal components and Silver plated metal components? 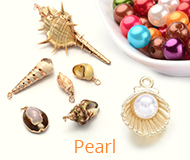 17.What's the difference between shell pearls and freshwater pearls? 18.Why do the chains fade? 19.Are all the goods in red copper color and antique bronze color nickel free? 1.Do you offer FREE samples? 3.Do you offer FREE catalog? 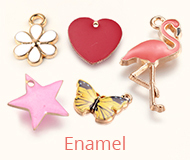 1.Does PandaHall offer customized making? 2.PandaHall offer repacking service according to your requirement? 1.How to upload your beadwork images to get more coupon value? 2.Can anyone submit customer work images? 3.What are the submission rules? 4.How much coupon value can I get? 5.Why do my submissions not approved? 6.How to get more Cash Coupon? 7.How will I know if my submission is accepted or declined? 8.Why I can't upload beadwork images? 2 . 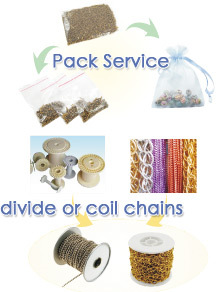 PandaHall offer repacking service according to your requirement? A) Jewelry Findings ---- We can divide and pack the Jewelry Findings which are counted by weight in Pandahall, in accordance with your appointed weight. If you have any question on processing services, please do not hesitate to contact [email protected]. Previous: Does PandaHall offer customized making?